Pro-Tech Heating and Cooling proudly sells and installs only quality water heaters — and the top-of-the-line Bradford White water heaters easily fit the bill. When designing and manufacturing their products, Bradford White goes above and beyond to create reliable and efficient water heaters using the latest technology. 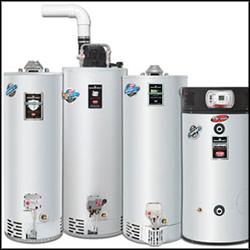 We understand the importance of purchasing the right water heater for you. Making the wrong decision can cripple important tools in your home or office and put a dent in your wallet. The professional technicians at Pro-Tech take great care to provide you with the best services and solutions, including helping you pick the right product for your unique situation. The eco-friendly water heaters from Bradford White offer an ideal solution to all your hot water needs. They offer top of the line energy efficiency alongside superior function — we pair that with the expert installation and maintenance of our technicians to ensure your complete satisfaction. For more information about Bradford White water heaters from Pro-Tech Heating & Cooling, please contact us here or call us directly at 616.453.5000.